Has anyone else tried the double-end bag? Its tons of fun! How would I google that? Totally on the fence about getting a double end. You say it's fun...? Fun is good. Rusty, regarding the red bags you have mounted and seen in your current avatar; Did you collect those over time from various places? They look new or at least very well maintained. They all the same bag? I think there are four 4213’s, a 4207, and a 4205. All in great shape from eBay over the last 2 years. I am going to set one up ASAP. Just need to find one on kijiji. Haven't tried one yet. 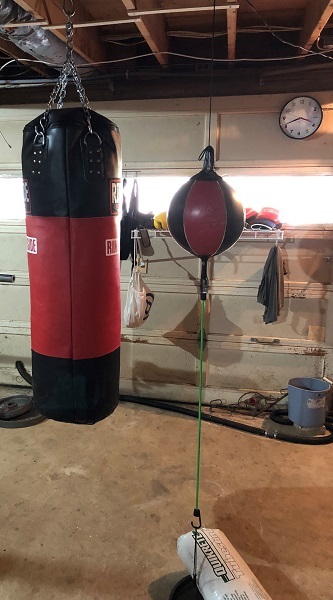 I have a double-end bag and agree that it's a fun option to the speed bag. I have a 10" round style. The "Mexican style" shape is fun too but has a different rhythm to it than a round bag. Got any pics? I'm curious how other people do the rigging. Bungee on both ends? I have paracord on the top and bungee on the bottom with adjustable links for changing the speed. I've tried it with the bungee on the bottom only, and on both ends. I prefer the latter, it's a little "wilder" IMHO that way. I had trouble getting the bag height correct with bungee on top and bottom. I have the bungee with the molded plastic hooks, so can't adjust the bungee length. Do you guys like using gloves, wraps, or bare hands? I think I prefer big boxing gloves. Maybe because it softens the punch and the bag doesn't rebound so wild?